A man who filmed himself in front of what turned out to be a month-long wildfire in California received a $60 million fine and a 20-year prison sentence after pleading guilty to arson. 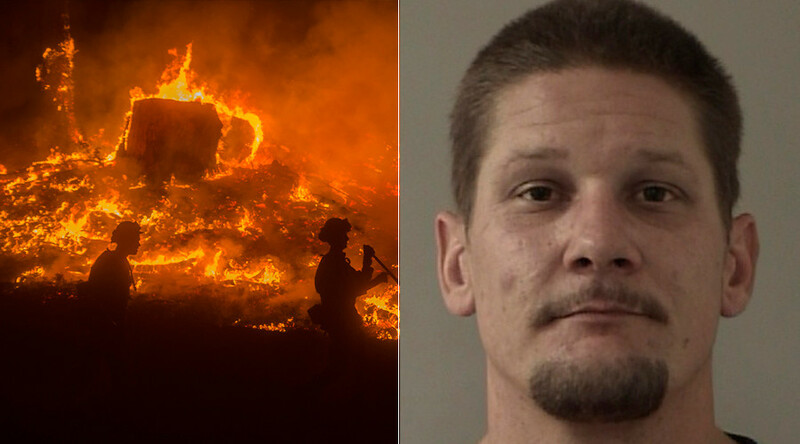 "I plead guilty because I did it," Wayne Allen Huntsman told the court Friday with three counts of felony arson brought against him for what became known as the “King Fire” in September 2014. Although initially Huntsman denied the charges, he told the court he was remorseful for what he had done, breaking down in tears a number of times during his court appearance. "I have cried many nights for the victims and their losses,” the 39-year-old said. "He's probably the most remorseful client I've ever represented and I hope the community understands that," said Huntsman's Chief Public Defender Teri Monterosso. As well as spending 20 years in prison, he has also been ordered to pay a largely symbolic amount of $60 million in restitution to those affected by the fire. It is unlikely he will deliver on that element of his sentence, since ex-offenders have trouble finding jobs, let alone ones that pay more than $1 million a year. OJ Simpson, for instance, has only paid a fraction of the $33.5 million he owes from the 1997 civil case for the murder of Nicole Brown and Ronald Goldman. Police released video-of-a-video footage of Huntsman standing in front of the fires the day he started them, which they obtained from a “good Samaritan” who gave the arsonist a lift away from the flames. “Listen, I got fire all around me," Huntsman can be heard saying in his video. "I'm stuck in the middle, babe." The court was also shown evidence of 911 calls Huntsman made reporting the fire as well as CCTV footage of him buying alcohol on the day of the fire. Nearly 100,000 acres in the north-central Sierra Nevada mountains were burned during the blaze, which started on September 13, 2014, along the King of the Mountain Road in rural El Dorado County. It wasn’t until October 13, 2014, that the 300 firefighters and personnel were able to bring the fire under control, with more than 100 buildings damaged during the period including 12 homes and thousands of locals displaced. Huntsman had a number of previous convictions including possession of stolen property, grand theft, and assault with a deadly weapon. In an unrelated, but shocking crime, Huntsman's sister Tami Joy was arrested in December for her role in the death of two children in California. She faces charges of murder, torture, child abuse, and conspiracy in the deaths of 6-year-old Shaun Tara and 3-year-old Delylah Tara, whose bodies were found in a storage facility in the northern California city of Redding.